I love cobb salads, and this one doesn't disappoint. This is like a polish your fine china sort of cobb salad because it has it all. There's crispy bacon, tomatoes, avocado, hard boiled eggs, crispy croutons, and a lemon dijon dressing. Everything comes together with kale, lacinato kale to be specific. It's not rough like curly kale, and when you let it sit in the dressing for a bit it softens into a craveable green. And yes I mean it, you'll crave these greens! Start by cooking the eggs. Place the eggs in a medium-sized pot. Add a pinch of salt and fill the pot with water until the eggs are covered by an inch or two. Bring the eggs to a boil, then turn off the heat (keeping the pot on the burner) and keep the pot covered for ~15 minutes to hard boil the eggs. Before assembling the salad chop up the eggs. Set aside. Meanwhile, fry up the bacon until crispy in an un-greased pan on medium head. Remove the bacon from the pan onto a paper-towel lined plate, reserving that bacon fat. To make the baguette croutons, add the cubed baguette into the hot pan of bacon fat, frying them up until golden. Make the lemon dijon dressing by whisking together the lemon juice, crushed garlic cloves, dijon mustard, and honey. Drizzle the olive oil in slowly, whisking to combine all the ingredients. Add the dressing to the kale, tossing to combine. Allow the kale to rest in the dressing for at least 10 minutes so the kale softens slightly. 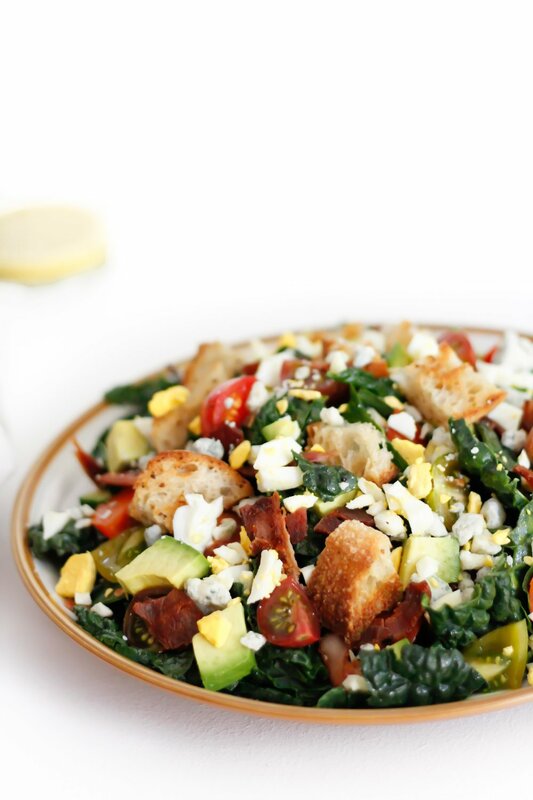 Assemble the salad by combining the dressed kale with the chopped eggs, bacon, baguette croutons, avocado, and tomatoes. Dig in.